Little India is located in Brickfields in Kuala Lumpur, and is known by that name because of the large amount of Indian residents and businesses there. The area was established in 19th century by the Chinese Kapitan of Kuala Lumpur, Yap Ah Loy, to set up a brick industry in order to supply the construction material to rebuild Kuala Lumpur after a flood and a fire. The area gradually progressed to be the centre for making bricks and was known as Brickfields. Visitors making a trip to Little India must be prepared to walk because Little India is actually a collection of Indian businesses, Hindu temples as well as heritage Indian quarters sprawled across Brickfields. The best way to tour Little India is via a guided tour, conducted by Kuala Lumpur City Hall on every 1st and 3rd Saturdays every month. One of the main features of the tour is the Vivekananda Ashram. It was constructed in 1904, with a Moghul-styled design and named after an Indian spiritual leader. Visitors following the tour will also walk pass rows of terrace houses known as The Hundred Quarters. Built in 1915, and considered a heritage, this is one of the few pre-war houses still found in rapidly developing Kuala Lumpur. Being an Indian community, there will naturally be temples. Located within the vicinity are 4 temples, namely the Maha Vihara Buddhist Temple, Shri Krisna Shrine, Sri Sakhi Vinayagar Temple and the Sri Kandaswamy Temple, all proudly displaying the colourful statues of different deities. Dropping by the business centre, visitors will get to shop for souvenirs and items that are not commonly found outside the Indian community such as curry and spices, Indian restaurants, incense and fragrances, Indian-style accessories and jewellery, kitchenware and textile shops. Brickfields is a culture and heritage hub of the Indian community that must not be missed. 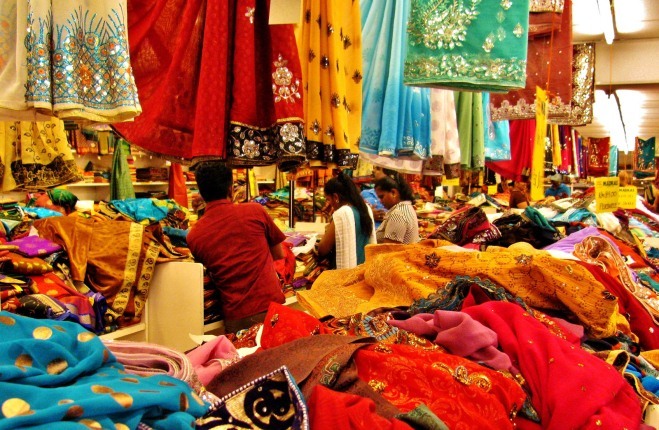 Little India in Brickfields is located within the KL city centre and is accessible via taxi or LRT (KL Sentral Station). Opening hour varied by shops and there is no entrance fee required to visit Little India.